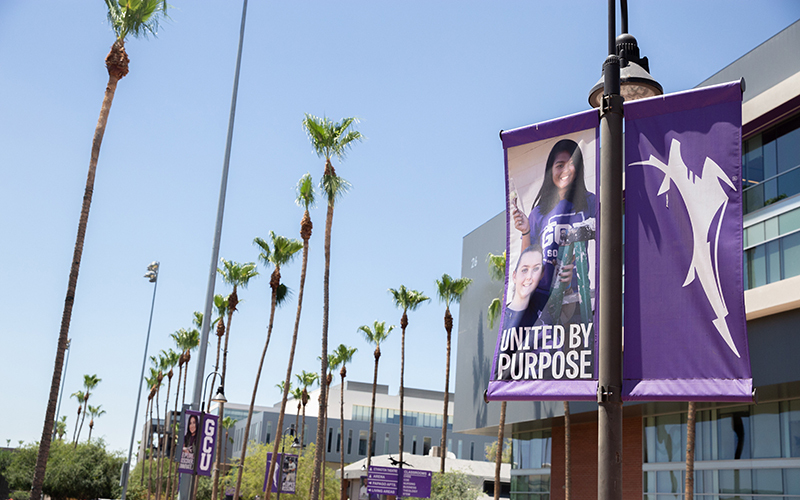 PHOENIX – Grand Canyon University, a private Christian school in Phoenix, is returning to nonprofit status – which it last held in 2004. The university’s parent company, Grand Canyon Education Inc., sold the school to the Grand Canyon University Board of Trustees for approximately $875 million, GCU President Brian Mueller announced at a press conference. The sale closed on Sunday, July 1. 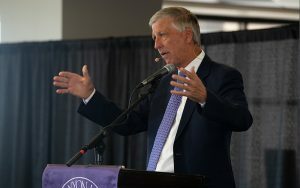 The sale will allow Grand Canyon University to become a full voting member of the National College Athletics Association (NCAA), and apply for a wider range of grants, among other opportunities. Mueller said that the university will establish a development office to pursue grants and philanthropic opportunities. The transition will be a good move, Mueller said, not just for GCU and its legacy but also for the students. “I don’t think I’ve ever been a part of something that has worked out as well as this has worked out for everybody,” he said. Opportunities to pursue accelerated research programs and grants will help ensure “that our faculty and students can have the same opportunities in the academy that every other not-for-profit university has,” he said. Grand Canyon operated as a nonprofit from 1949 until 2004, when, facing possible closure due to debts of about $20 million, it transitioned to a for-profit university. It became a publicly traded institution in 2008. Since then, the school has been expanding rapidly, investing more than $1 billion in infrastructure, Mueller said. GCU has explored transitioning back to nonprofit status since 2015, but university officials said the effort was stalled in part because the Higher Learning Commission – a regional university accreditation organization – didn’t think it had the appropriate guidelines in place to evaluate such a transition. GCU sought reapproval for the transaction after the commission adopted new accreditation guidelines in late 2017, the university said. Since then, the university pursued approval for the transaction from state and federal regulators and has transferred tangible assets from Grand Canyon Education Inc. to GCU, including all part-time employees and about 35 percent of its full-time employees. The remaining full-time faculty will continue to be employed by Grand Canyon Education. Mueller will retain his position as university president, and he will continue as CEO and board chairman of Grand Canyon Education. Mueller stressed that holding both positions aligns with Higher Learning Commission guidelines. He emphasized that GCU and GCE will maintain independent governing boards, and that no one else will serve dual roles across both boards. “The academic mission of the institution will always be run by the university,” Mueller said. Grand Canyon is expecting to enroll about 21,000 students on its Phoenix campus for the fall semester, and about 70,000 online students, according to data provided by the university. Nate Carpenter, a former student body president and current GCU employee, said he thinks the transition “only betters” the school’s image. Carpenter doubts the transition to nonprofit will affect how students identify with the university, but he said they’ll definitely notice the new opportunities that will come from the transition.